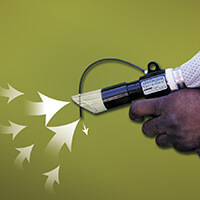 Use engineered air nozzles for high performance! 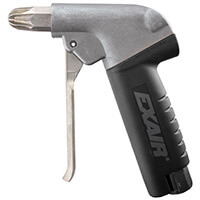 EXAIR’s Safety Air Guns eliminate these problems. 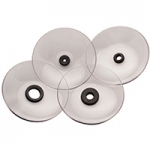 They are durable and comfortable to use. Each model uses an engineered Air Nozzle that provides superior performance by entraining large volumes of surrounding air. Safe operation is assured along with low air consumption and noise levels. 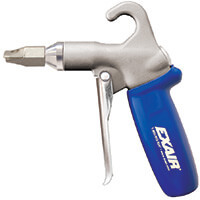 Four Safety Air Guns are available. 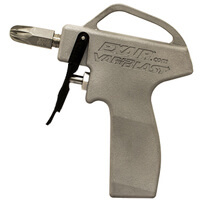 The Precision, Soft Grip, Heavy Duty and Super Blast Safety Air Guns are available with a variety of air nozzles (listed in order of force). 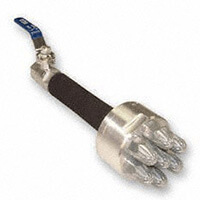 Those with stainless steel air nozzles provide higher mechanical wear resistance while withstanding corrosion and high temperatures. 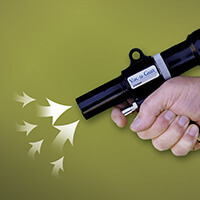 PEEK Air Nozzles provide protection from accidental impact with the target and outstanding corrosion resistance. Air consumption, force and sound level are shown for all models. Click a product category to find out more!